Now that when we know “Satoshi Nakamoto” is the Pen Name of the polymath “Nick Szabo” and that Bitcoin is a test dummy of NSA which is surely not coded by Nick Szabo alone. Let us see a partial (roughly just 20%) list of Nick Szabo’s core team of developers and government agents that made practical implementation of Bitgold a reality by coding the Bitcoin client software. The picture below was leaked by a reddit user. 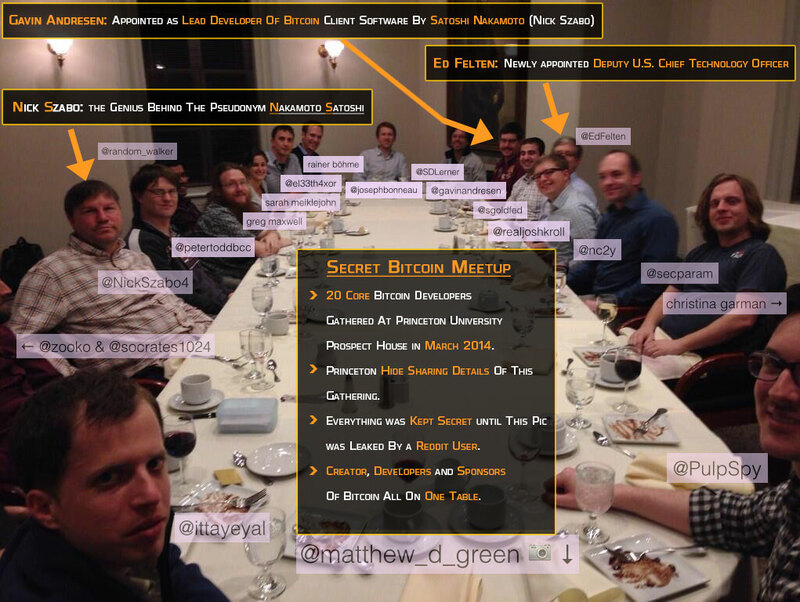 This meeting of 20 core bitcoin developers was privately and secretly held at Princeton University in March 2014. Princeton university surprisingly did not publically share any details of this supper on there official website where they only mentioned about a public workshop on Bitcoin awareness and blockchain technology. The public conference was organized after that secret meeting. I present to you the real Satoshi Nakamoto (Nick Szabo) and his secret team of core bitcoin developers all sitting on a single supper table. This is the biggest proof of who created Bitcoin! Following is the complete list of people in the picture above along with there twitter handles. Almost most of these attendees participated in the public workshop but guess who didn’t participate? Yes you are right: Nick Szabo! Did you recognize Dr. Edward Felten among this group? He was Deputy U.S Chief Technology Officer during Obama administration appointed in May 2015. He was responsible for making technology and science policies. A future government officer, Bitcoin creator and 20 core developers all on the same table and meeting secretly... Interesting isn’t it? All public videos were uploaded to Youtube and also to Princeton webpage but as expected none of these videos included Nick Szabo. I am sharing one such video from that Bitcoin workshop and conference held at Princeton University, which includes Edward Felten amongst the panelists. Watch with your own eyes the gradual mind programming of academia in United States towards a bogus currency that is banned in many countries, marked as an illegal tender and which acts as the perfect tool for tax evasion, money laundering and darknet million dollar daily drug sale(all figures will be shared in Chapter#2). Once this picture was leaked a staff member at Princeton University had no choice but to confess that such meeting actually took place. Although he tried acting like if it was nothing too big to be discussed and that Nick Szabo’s attendance was nothing exceptional. Read his excuses here.